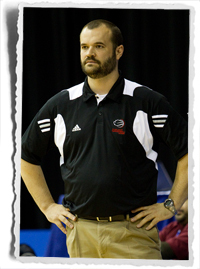 Wheelchair Basketball Canada congratulates Bill Johnson, head coach of the Canadian Women’s National Wheelchair Basketball Team, who was honoured yesterday with the Peter Williamson Memorial Award at Sport Manitoba’s 2012 Coaching Manitoba Excellence Awards ceremony. The Peter Williamson Memorial Award honours coaches who work with high performance athletes that compete at the national or international level. The Coaching Manitoba Excellence Awards, presented by Manitoba Lotteries, aim to recognize and celebrate the outstanding achievements and significant contributions coaches have made over the years to their athletes and their sport through coaching. A native of Winnipeg, MB, Johnson took over head coaching duties for the Canadian women’s team in 2009. He led the team to a bronze medal at the 2010 World Championships and a silver medal at the 2011 Parapan American Games. He will also be at the helm as Canada pushes for the podium at the 2012 Paralympic Summer Games in London, England. Sport Manitoba is a not for profit organization and the lead planning, programming and funding agency for the development of amateur sport in Manitoba. Located in the Sport for Life Centre, Sport Manitoba partners with over 100 organizations to deliver sport in our province and is responsible for programs including the Power Smart Manitoba Games, Coaching Manitoba, Team Manitoba, Manitoba Sports Hall of Fame & Museum, and KidSport. Services provided include the Sport Medicine Centre, Sport Performance Centre, and Sport Resource Centre.